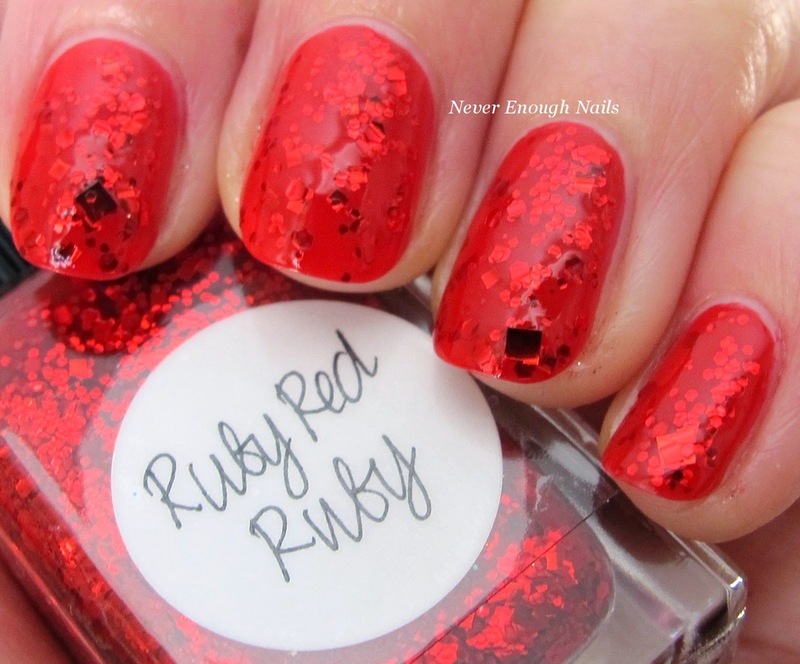 Never Enough Nails: Red Glitter Two Ways with Lynnderella! Today I have two very beautiful red glitter polishes from Lynnderella. I had these sitting next to each other in my "to review" box, and I love that they are both red glitters from the same polish maker, but they are so different from one another. 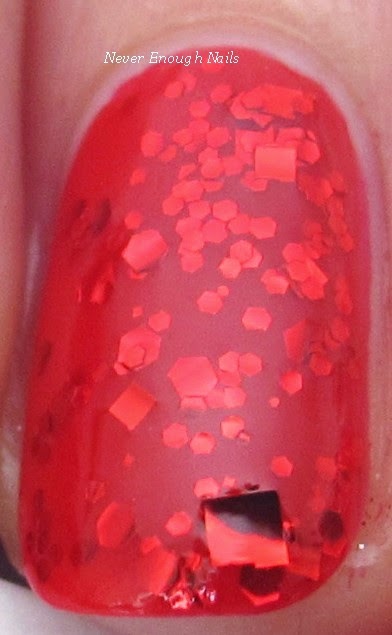 Lynnderella Rad Red Party Dress is a red holo microglitter from the holiday 2014 Deck the Nails (with Lynnderellas) collection. It has some larger metallic red glitters, along with the super sparkly microglitter. This is three thin coats of Rad Red Party Dress all alone. It is nicely opaque, and could have been done in two thicker coats as well. It was easy to apply and the consistency is perfect. I love how much holo glitter is in this one, it's SO sparkly! In all of my Lynnderella loving years, I have never owned Lynnderella Ruby Red Ruby- until now! 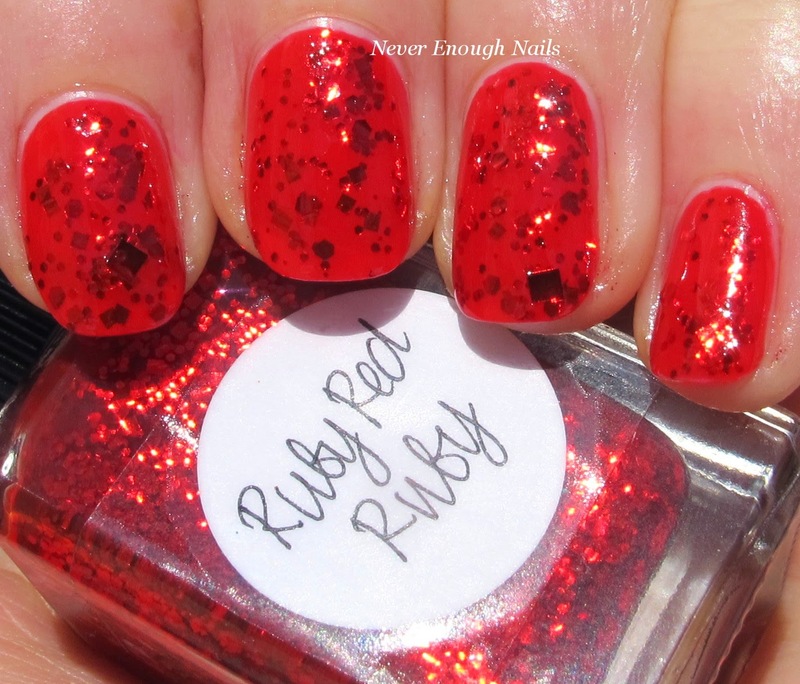 Ruby Red Ruby is a classic Lynnderella that has been around for a long time now, and I feel like I'm the last person to get it. What was I waiting for? It's gorgeous! There are a couple different sizes and shapes of metallic red glitter in a red base. It has that kind of glowing embers look to it. This is two thin coats of Ruby Red Ruby over one coat of Essie Lollipop. Ruby Red Ruby could be worn alone in a few coats, but I layered it to conserve the pretty! It was very easy to apply, no problems at all! I really love both of these polishes and they have convinced me to wear red more often! Both are part of Lynnderella's core line and are available now at lynnderella.com and lynnderella.storenvy.com. For more information on Lynnderella polish, check out lynnderella-lynnderella.blogspot.com. I am kind of hoping for a spring collection from Lynn!! Side note- Look at the sunshine I had for these pictures!! Actual real sunlight! Winter may some day be over! I like them too Ananka, but I can't decide which I like more haha!